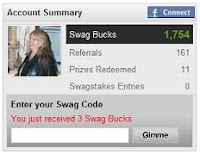 Home SB code , swidget code Swag Code Alert! 8/1/11 - 5th Code! Swag Code Alert! 8/1/11 - 5th Code! There is a code hint in the Swidget!